Courtesy photo Four generations of Jonah Smith’s family include (from left): Jaelyn Ritchey, mother; Robin Ritchey, great-grandmother, holding Jonah; and Jay Ritchey, grandfather. All live in Blue Knob. Jonah was born on his great-grandmother’s birthday, April 26. The Altoona Mirror accepts photos of families who recently added a fourth or fifth generation. The photo may include one representative of each generation and should include identifications for everyone in the photo. It should include the person's name, town and how they are related to the baby in the photo. Photos should be submitted within six months of the new addition and can be emailed to community@altoona mirror.com or mailed to Community News, Altoona Mirror, P.O. Box 2008, Altoona, PA 16603. Please include a daytime telephone number. For more information, call 946-7459. 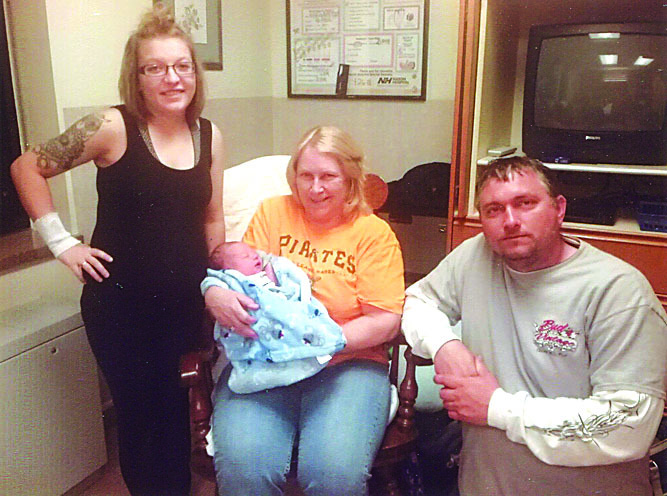 Four generations of Jonah Smith’s family include (from left): Jaelyn Ritchey, mother; Robin Ritchey, great-grandmother, holding Jonah; and Jay Ritchey, grandfather. All live in Blue Knob. Jonah was born on his great-grandmother’s birthday, April 26.
mirror.com or mailed to Community News, Altoona Mirror, P.O. Box 2008, Altoona, PA 16603. Please include a daytime telephone number. For more information, call 946-7459.